BANKllect is a decentralized peer-to-peer bank network. Its main task is to create an unique and new generation bank ecosystem where each its participant will have a possibility to choose a needed bank service and earn on it. At the heart of BANKllect network is a participant. The participant is an individual or company with or without initial financial capital (fiat money, coins, tokens). Our own technology «Proof of Participation (PoP)» allows the participants to earn money by a level of its activity in BANKllect network. Mining process is as simple as choosing one of the bank services and earn on it. The name of BANKllect 's token is «Sphere» (SPH). The name of the token was not accidentally chosen. BANKllect is going to function inside Decentralized Intellectual Advanced Network (DIAN), «IntellSphere» (Intellectual Sphere)". 1. «DEPOSIT & CHECKING ACCOUNTS». Opening and storing cryptocurrencies are realized by «Program of intellectual account (PIA)». In contrast to traditional deposit of traditional bank «program of intellectual account» presents a series of advantages. Among those advantages are, first, no need for a bulk of documents, second, dynamic interest that increases with deposit cryptocurrency regardless of deposit time term. a. SLCL doesn't have such notion as client credit history. For example, as soon as borrower pays off his credit debt he will be clear for any other credits. b. SLCL let any user to be as a lender as a borrower. Amount of money which BANKllect user has in his wallet doesn't make sense. a. insure any object that can be tokenized. b. earn money on an insured object. d. transfer any type of money. e. pay for any services. f. issue virtual payment cards. g. issue virtual savings cards. BANKllect's team developed «Forecast & Earn System (FES)» which is based on own forecast mathematical method «M-method». This method was tested on FX market and proved its high profitability. Real time asynchronous system «Excoin» lets users convert any type of crypto money in one another momentarily. 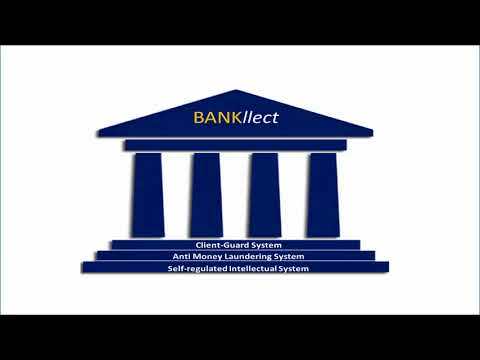 BANKllect presents a full package of bank services of any type for as individual as business. At the heart of BANKllect lies a revolutionary technology «Smart Transactions» inspired by Bitcoin's transaction architecture. «Smart Transactions», first, eliminates many problems of Bitcoin transactions, second, introduces a lot of new functionalities for smart analysis. Realization of ITS (Instant Transaction System). BANKllect Launch (mobile & dekstop). Realization of CIS (Card Issue System). Realization of CES (Currency Exchange System). Realization of CIP (Client Insurance Program).